How many times have you needed to wash a sweater or other delicate item, but dreaded having to air-dry it, or throw it in the dryer with the regular laundry in hopes that it will survive the journey? Samsung has built a solution with the FlexDry DV60M9900, a $1,300 double machine that boasts a delicate dryer on top, and a large capacity tumble dryer below. We put our clothes in both to see how it went. Find out in our review below. Like its companion, the Samsung FlexWash, the 7.5 cubic-feet capacity FlexDry DV60M9900 — a 2017 Home Awards winner — is a beast. Standing at 47 inches tall (20 inches taller than the Whirlpool Hybrid Care), with a depth of 32.5 inches, and a width of 27 inches, the appliance is sleek, black, and gorgeous. It features chrome edging and a blue LED display panel across the front. The size and beauty of the appliance is impressive. The bottom tumbler can easily fit a load of towels or several pairs of jeans. While not as big as the Maytag MED855DW, it’s definitely big enough for a typical load of laundry. 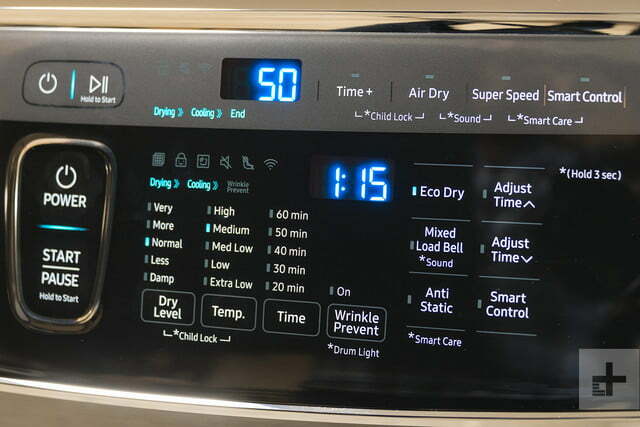 At first we were intimidated by the sheer number of buttons on the display (24 on the bottom dryer and 10 more on top for 34 total), but we soon realized that the buttons were much more user friendly than the dial that you see in appliances like the Maytag MED855DW. You can tap on the option that you want rather than having to turn a nob until you get to the right setting. It’s a faster, more direct interface. Samsung offers the FlexDry in gas and electric, although the gas version only provides monitoring via the corresponding app for safety reasons. The delicate dryer sits on top of the device, and has its own power button and control panel. You access the top dryer by opening the accordion-like latch on top, then placing your items on a drying rack that sits in the middle. If you’re expecting a small tumble dryer, forget it. This is more of a drying rack with a fan. Samsung recommends placing one or two sweaters or shirts, six undergarments, or four accessories — like neckties — at most. Rather than tossing clothes in as you would a tumble dryer, you carefully lay them on the rack. 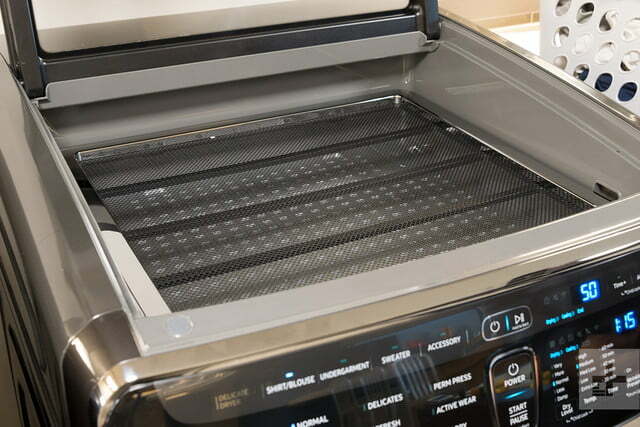 The appliance is sleek, black, and gorgeous. The top dryer control panel allows you to select shirt/blouse, undergarment, sweater, or accessory. You can also choose whether you want to air dry your item, or add drying time. Other buttons include super speed (fast drying) and smart control, which we’ll talk about later. The bottom drum is an entirely different story. There, you have a large capacity tumble dryer with numerous features. 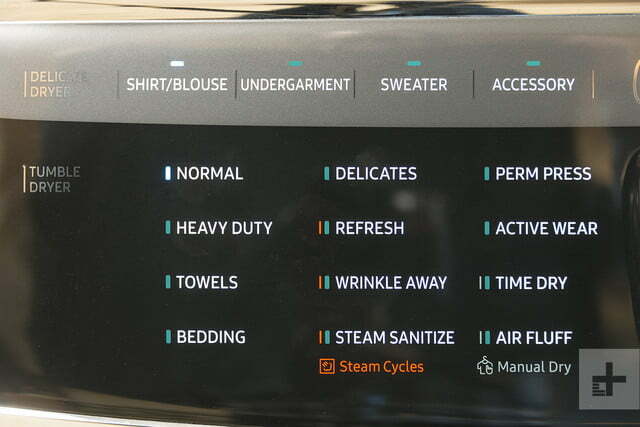 Samsung uses sensor technology to detect dryness, and there are several steam settings to de-wrinkle or sanitize clothes. You can choose from 12 different wash settings including normal, heavy duty, towels, bedding, delicates, refresh, wrinkle away, steam sanitize, perm press, active wear, time dry, and air fluff. Depending on the setting, you can vary the dry level from damp to very, the temperature from extra low to high, and the time (if doing manual dry) from 20 minutes to 60. One neat feature is a separate button called wrinkle prevent, which provides three hours of intermittent tumbling in unheated air at the end of the cycle to reduce wrinkling. 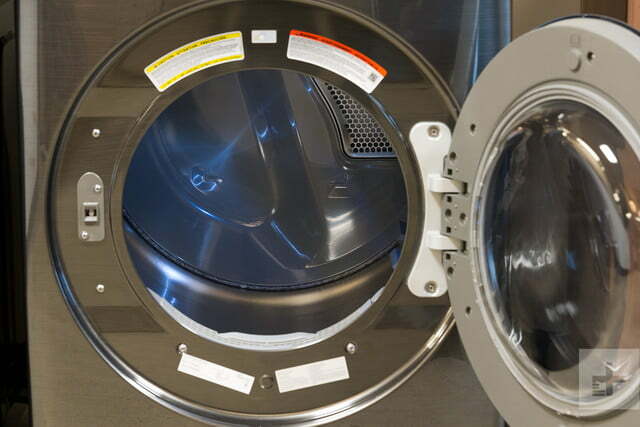 The anti-static button shoots steam into a drying load in a late stage of the cycle, to help reduce static. The door of the machine can be adjusted to open from either side, which is a nice plus. The bottom dryer is Energy Star rated, while the top dryer is not. While the Samsung FlexWash is a true double washing machine, the FlexDry isn’t a two-in-one tumble dryer. Think of it as more of a large dryer with a small quick drying compartment on top. The delicate dryer features a mesh drying rack where you lay delicates. The fact that you can only lay a few items into it makes it not as useful as we hoped it would be. Once you toss your clothes in, you have lots of options to choose from. On our first time using the delicate dryer, we didn’t read the instructions and placed three sweaters into it. We laid the garments out on the rack and quickly realized that three sweaters were one too many. We thought, ‘oh well’, and kept them in to see what happened, using the sweater setting to test out drying capabilities. When the cycle was finished, we found our sweaters were still damp. It was then we dug into the owner’s manual to discover that Samsung recommends that you only place two sweaters in at a time. Oops. We removed one, and started the 50-minute cycle again. They came out dry. After that, — again following instructions – we placed two shirts. They came out dry, and free of wrinkles, which was a pleasant surprise. While the delicate dryer is a neat feature of the FlexDry, we wish it were more utilitarian, or at least able to dry more than just two shirts or a few undergarments at a time. The bottom dryer was more straightforward to use. Once you toss your clothes in, you have lots of options to choose from. If you press the normal setting at medium heat, it’ll indicate that the dry time will be one hour, 15 minutes. Our clothes consistently came out bone dry and ready to wear. Oddly, the permanent press setting only took 32 minutes on the FlexDry. While that setting uses more energy, according to the owner’s manual, it’s supposedly gentle on your clothes. Every time we used the cycle, our clothes came out perfectly. 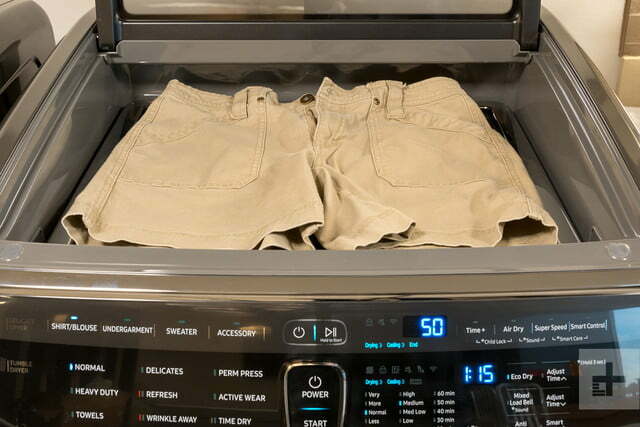 Unlike the Electrolux Front Load Compact dryer, which left some of our clothes wet, the FlexDry’s sensor seemed to work no matter the load size. We ran several loads of varying sizes on several settings, and found that our clothes came out dry every time. The time indicator that the machine gave us at the beginning was largely accurate. Other dryers, such as the LG Turbo Stream, aren’t always accurate, especially with smaller loads. If you’re expecting a small tumble dryer, forget it. If you’ve ever needed to crisp up a pair of already-dry-but-wrinkled jeans before, you’ve probably thrown them in the dryer for a few minutes. We did that with a collared cotton shirt and a pair of khakis, and hit the wrinkle away with steam setting. After 20 minutes in the cycle, our clothes came out looking less wrinkled and wearable, but not iron-fresh. That is a task that no dryer has accomplished so far, though – the FlexWash does well enough. Throughout each cycle, indicator lights blink to tell you whether your clothes are drying, cooling, or are in wrinkle prevent mode. Like the FlexWash, a very long mechanical chiming song indicates that the cycle is complete. You can turn this noise off if you find the song annoying. The FlexDry connects to the Samsung Smart Home app. Anyone with Android 4.0 or higher or iOS 8.0 or higher can download the app, open it, click “add device” and follow the instructions from there. Once in the app, you can use your phone as a remote control for your dryer, choosing cycles, starting and stopping cycles, and adding time to cycles as necessary. You can also customize alerts to notify you when your load is finished. While it’s neat to make the dryer rumble to life while sitting on our couch, we’re not sure we’d use it very often. It is useful for receiving notifications about maintenance, or when the laundry is finished drying, but the dryer needs to be powered on and connected to Wi-Fi before you can start and stop loads. The only way we see this coming in handy is if we put clothes in the dryer, but then dashed out the door and forgot to hit the start button. How often does that happen? Samsung offers a one year parts and labor warranty that begins on the original date of purchase. Overall, the Samsung FlexDry is a solid dryer. 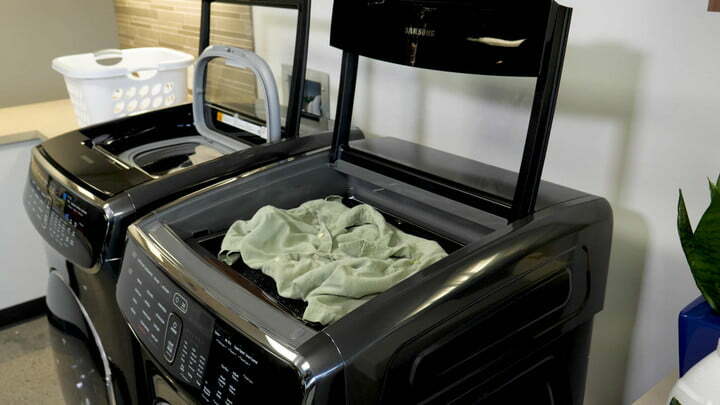 While we wish the delicate dryer gave us more room for clothes, it’s still a great addition to the appliance. The bottom tumble dryer is a reliable and solid machine with lots of easy-to-use features. At this point, there’s nothing like the two-dryers-in-one FlexDry on the market. If you don’t need the delicate dryer feature, consider going for the Electrolux Dryer With Allergen Cycle. The Electrolux costs a bit less at $1,000, and is a reliable dryer with some unique features. The LG Electric Dryer with Turbo Stream also has some great features like nine cubic feet of capacity. Samsung is a well-known brand in the world of appliances, and with an extended parts warranty and continuous software updates, you’ll be in good hands. A washing machine will last you between 10-14 years, according to experts. 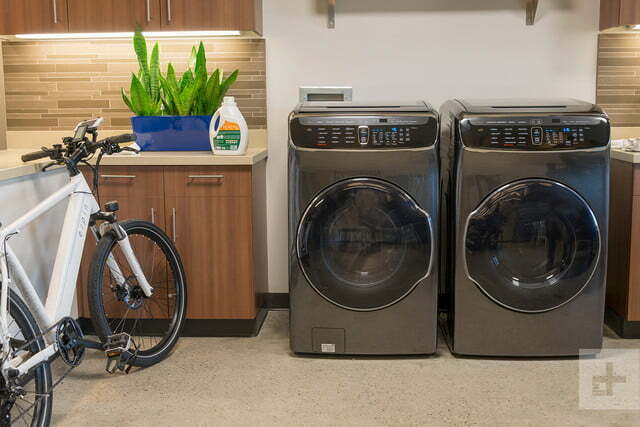 If you’ve got lots of room in your laundry room and some cash to spare, buy the FlexDry. 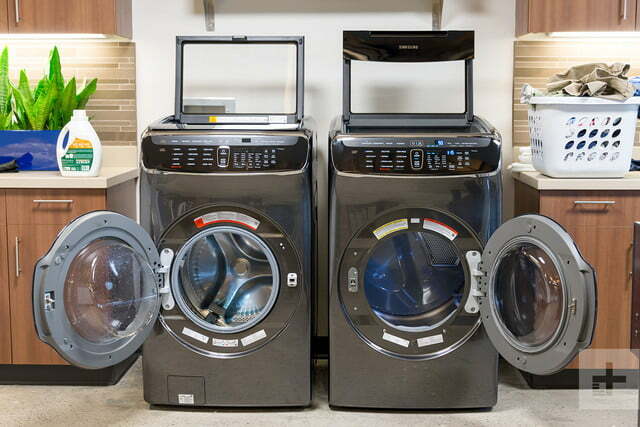 You’ll be more than happy with the two-dryers-in-one feature.